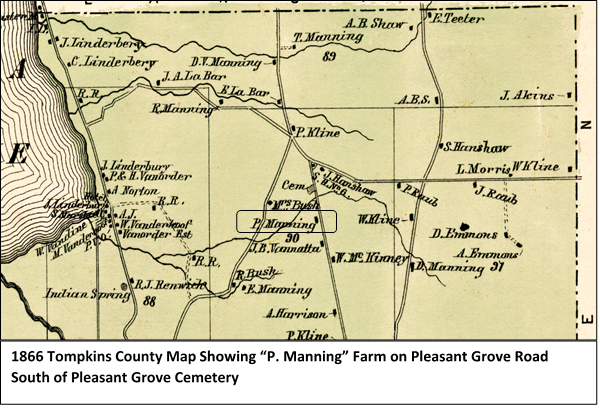 ​A succession of notable farm families owned the property now known as 176 Pleasant Grove Road, including the Mannings, Labars, and Hanshaws. Tompkins County Assessment records indicate that the farmhouse was built in 1890, but that date may just be an estimate. Parley Manning (1811-1892) inherited the farm in about 1840 and owned it for more than 50 years. Probate and census records reveal details about lifelong bachelor Parley’s role as head of his extended family. After John’s death in 1840, Parley was an heir and administrator of his father’s estate. In 1850, Parley was living in the household of his stepmother Catharine, along with his sister Sally, his half-siblings, and a baby nephew. The farm was valued at $2,500. Two decades later, Parley was head of a household including his sister Sally and his half-brother John, who was described as mute, or unable to speak. Parley’s farm was valued at $1,500, and his personal estate $6,000. John’s portion of the farm was set at $2,000, while his personal estate was pegged at $1,000. Parley continued farming until his 70s. In 1880, his 18-acre farm was valued at $1,200, and on it the previous year he harvested 3 tons of hay, 10 bushels of “Indian corn,” 30 bushels of rye, and 15 bushels of apples. In addition, he sold $200 worth of butter and 200 dozen eggs. ​Parley had enough cash to extend loans to others. In 1879, Parley loaned farmer Angle B. Shaw more than $5,000. Shaw transferred about 200 acres to Manning as collateral. Late in his life, Parley extended credit to a family member, with unfortunate results. Parley’s niece, Harriet Almira Manning (1839-1905), was married to farmer and politician John E. Cady of Dryden. In 1888, an Ithaca Journal article, "A Sad Failure," reported on John Cady's bankruptcy. His financial failure had ripple effects throughout Tompkins County, since many people had given Cady their savings to invest, especially women. Parley Manning, the Journal noted, “is [the Cady’s] creditor to a very large amount.” Tellingly, Parley’s position in the community must have been significant. The Journal cited Parley’s investment with the Cadys as “perhaps one of the surest indications of the high water guage [sic] of the reliance of the community” on the Dryden family's financial affairs. At the time of his death in 1892, Parley owned four farms totaling about 255 acres. The elderly bachelor died without a will, and the proceeds of his estate were distributed to some 40 heirs. Many thanks to the current owners of the property, who shared deed information with the author. 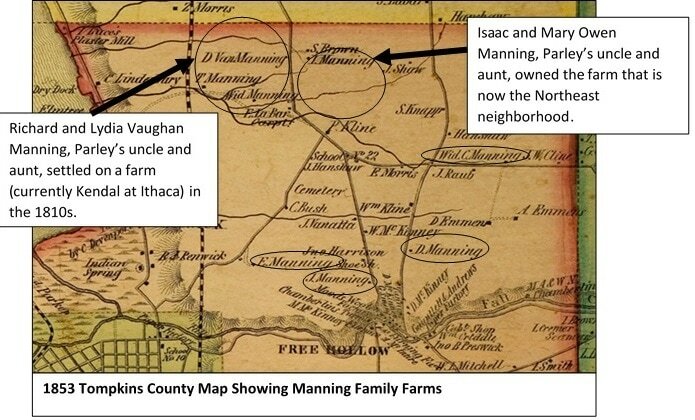 ​ Year: 1850; Census Place: Ithaca, Tompkins, New York; Roll: M432_606; Page: 264B; Image: 132. Year: 1870; Census Place: Ithaca, Tompkins, New York. 1880; Census Place: Ithaca, Tompkins, New York; Archive Collection Number: A71; Roll: 71; Page: 3; Line: 9; Schedule Type: Agriculture. ​ Angle B. Shaw to Parley Manning; Tompkins County Mortgage Book 10, Page 67; March 27, 1879. "A Sad Failure," Ithaca daily journal, January 23, 1888, Page 2, Image 2; Persistent Link http://nyshistoricnewspapers.org/lccn/sn83031157/1888-01-23/ed-1/seq-2/.